The inspiration for this Haggadah was an exhibit of creative works anchored in the seder experience, titled “Freedom Imagined; Freedom Lived – an artistic review of the Passover Promise” and curated by the Museum of Imajewnation. We have attempted to produce a Haggadah that would give primacy to the artwork and the artists’ visions of Freedom. The insights of these many contributors, visual as well as prose, cry out to us. We ask you, “How much can you see? Take another look. See more. What is Freedom? Who is free? How do we become free? Are you creating Freedom?” We encourage you to explore at your own seder, and we have appended questions we hope may stimulate your discussions of Freedom, of Judaism, of the world of the Haggadah, and of our world today. 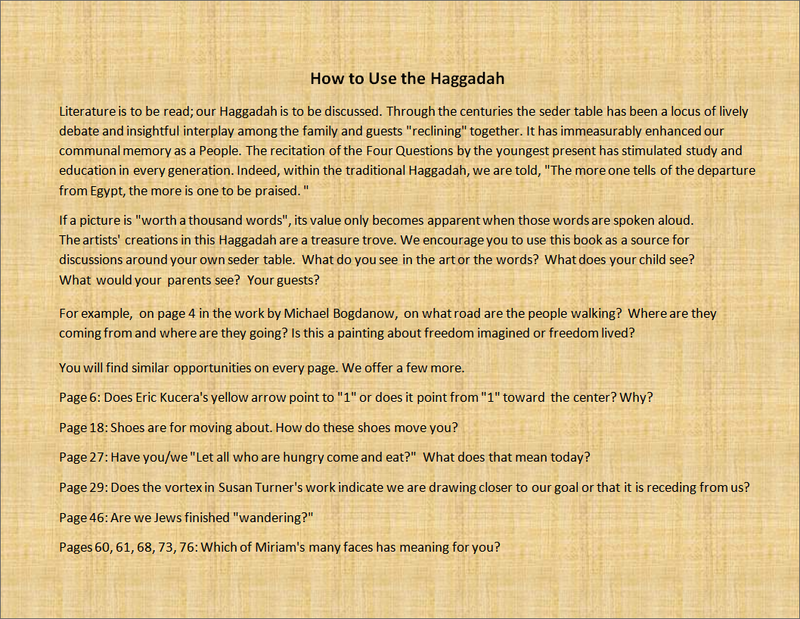 If you are interested in purchasing a copy of The Museum of Imajewnation’s Haggadah, please use the Contact Us page.